The latest news from the red planet and the Mars rover, Curiosity is that it has made a great discovery. And though NASA refuses to release any information regarding this discovery until they can confirm it, there is much speculation. 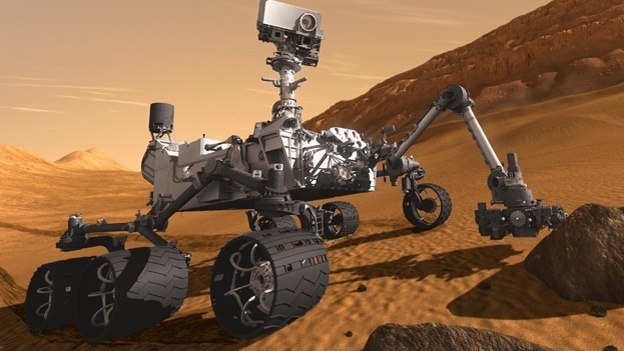 The most popular bit of guesswork is that Curiosity stumbled upon the very thing it was sent there to discover - evidence of whether or not Mars supported life as some point. Being has how they need to double check their data in order to avoid putting their foots into their mouths, it will be a bit longer before they make any sort of official announcement about the details of the discovery. So, we shall all have to wait until December to find out the truth of the matter. Hopefully, they have all their analysis done by then, as they’ve already announced that they’ll be talking about their findings at the American Geophysical Union fall meeting that takes place from December 3rd to the 7th. Until then, people will just have to guess at what the mystery is. Though if it’s not the discovery of life, it better be pretty big, cause the hype caused by all the speculation is out of control at this point. After this mystery is taken care of, scientists have plans to send Curiosity off on its next mission, testing out other bits of equipment on the rover and hopefully bringing even more useful and history-worthy data back to NASA and the planet Earth.